Today's Polls: Should Mccain Blow Off Ohio? Well, scratch West Virginia from the swing state list for the time being. Both Public Policy Polling and Mason-Dixon have new polling out in the state, and they give John McCain leads of 8 and 6 points respectively. It's possible that this is one of those areas where McCain's attacks on Barack Obama are having some resonance. It's also possible that the state was never all that close to begin with, and that the ARG poll from two weeks ago that gave Obama a substantial lead was one of those infamous ARG outliers. By no means is the state totally unwinnable for Obama -- and I'd still like to see what, say, Research 2000 or Rasmussen or SurveyUSA have to say about it -- but in all probability, it is pretty far from the tipping point. 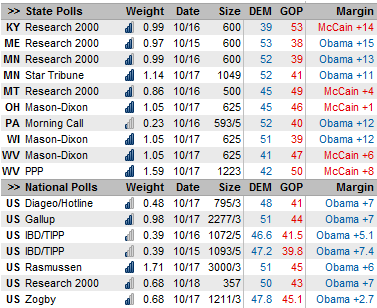 The national tracking polls are actually in pretty good agreement with one another, with IBD/TIPP, Research 2000, Gallup, and Hotline all settling in the 5-7 point range. Zogby is the outlier at Obama +2.7, and that's because Zogby has the odd practice of fixing his poll's party identification weights based on what they were in the last presidential election. In Zogby's world, then, it's still 2004, when there were roughly as many Republicans as Democrats. Although Zogby's trendlines may be worth looking at, his topline numbers are basically unusable. John McCain does get a good result in Ohio from Mason-Dixon, which has him ahead 46-45. Mason-Dixon has had a mild Republican lean this cycle, and so this result isn't necessarily incongrous with other polling that gives Obama a small lead in the Buckeye State. Nevertheless, there is an argument that the McCain people should take a gamble and not devote a lot of resources to Ohio, which is currently running 2-3 points behind Obama's national numbers. That's not to say that McCain will win Ohio -- on the contrary, Obama remains the favorite -- but if the national popular vote draws back to a rough tie, which is a precondition for any McCain victory scenario, it would seem unlikely that Ohio defies the trend. Meanwhile, Obama remains ahead by double digits in two polls of Minnesota, and in another poll of Wisconsin. He now has in excess of a 90 percent chance of winning every one of John Kerry's states.